For the town in Australia, see Kingsthorpe, Queensland. Kingsthorpe is a northern suburb of the county town of Northampton, England. The 2011 Census recorded the population of the district council ward as 4,477. For centuries Kingsthorpe was a rural village, with a parish of 1,020 acres (410 ha). Late in the 19th century it was made a civil parish. But Northampton Municipal Borough absorbed most of the parish in 1900 and the remainder in 1931. A tributary of the River Nene called the Naseby Source or Brampton Nene flows through the area to the west from north to south, joining the Nene west of the Carslberg Brewery near the south bridge. The village green retains a rural character, away from the main roads, overlooked by the parish church and vernacular cottages. Kingsthorpe formerly had three water mills, some evidence of which can be found in the countryside. The suburb's amenities are centred on the main A508 and A5199 roads that link central Northampton with Market Harborough and Leicester respectively. The place-name is derived from the Old English cyning and Old Danish torp, meaning the King's hamlet or farmstead. In earlier centuries the village was called simply Torp (11th century) or Thorp (12th and 13th centuries). It was only in the 14th century that it started to be called Kyngesthorpe. The Church of England parish church of St John the Baptist was built in the 11th century and still has remains of some original late Anglo-Saxon or early Norman windows. The north chapel and north and south aisles were added about 1170–80. The church had a south chapel by about 1180. Part of the chancel was built in about 1220. In the 14th century the crypt was built, the chapels were extended eastward and most of the current windows were inserted. The west tower and recessed spire are 14th- or 15th-century. The tower has a ring of six bells. Robert Atton of Buckingham cast the second bell in 1621 and the fifth bell in 1622. Henry I Bagley of Chacombe cast the tenor bell in 1671 and Henry II Bagley cast the third bell in 1680. Alfred Bowell of Ipswich, Suffolk cast the treble and fourth bells in 1911. The pulpit is Jacobean. There is a monument to Edward Reynolds, who died in 1698. The church was restored in 1863 under the direction of the architect William Slater. It is a Grade I listed building. The Dallington Iron Ore Co Ltd briefly quarried iron ore north of the village. The quarry was between what is now the A5199 and the then railway to Market Harborough (now disused). The quarry operated from 1859 to 1861 or slightly longer. The ore was taken away by rail. The site of the quarry is now covered by housing. A Northampton Corporation Tramways route served Kingsthorpe until the network was closed at the end of 1934. Joan Hickson, who played Miss Marple in the Miss Marple BBC television series, was born in the village. Actress Judy Carne's parents were greengrocers in the village. Lesley Joseph, who played Dorien Green in the television comedy series Birds of a Feather, was raised here and lived in the suburb until the age of 18. ^ "Kingshorpe ward population". Neighbourhood Statistics. Office for National Statistics. Retrieved 5 July 2016. ^ a b c Salzman 1937, pp. 81–88. ^ a b c d Historic England. "Church of St John the Baptist (Grade I) (1190502)". National Heritage List for England. Retrieved 9 April 2018. ^ Pevsner & Cherry 1973, p. 339. ^ a b c Pevsner & Cherry 1973, p. 340. ^ Dawson, George (14 December 2010). "Kingsthorpe Northampton, Northants S John Bapt". Dove's Guide for Church Bell Ringers. Central Council of Church Bell Ringers. Retrieved 9 April 2018. ^ Tonks 1989, pp. 151–152. ^ "A 'homecoming' for Lesley Joseph". BBC Online. 22 April 2008. Mills, AD (1991). A Dictionary of British Place-Names. Oxford: Oxford University Press. ISBN 0-19-869156-4. Pevsner, Nikolaus; Cherry, Bridget (revision) (1973) . Northamptonshire. The Buildings of England (2nd ed.). Harmondsworth: Penguin Books. pp. 339–341. ISBN 0-14-071022-1. RCHME, ed. (1985). "Kingsthorpe". An Inventory of the Historical Monuments in the County of Northamptonshire. 5 – Archaeology and churches in Northampton. London: Royal Commission on the Historical Monuments of England. pp. 300–310. Salzman, LF, ed. (1937). A History of the County of Northampton. Victoria County History. IV. London: Oxford University Press for the Institute of Historical Research. pp. 81–88. Tonks, Eric (April 1989). The Ironstone Quarries of the Midlands Part 3: The Northampton Area. Cheltenham: Runpast Publishing. p. 151–152. ISBN 1-870-754-034. 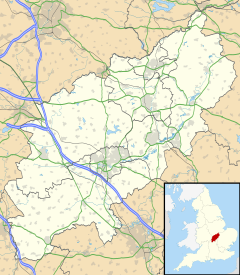 Wikimedia Commons has media related to Kingsthorpe, Northampton. "Kingsthorpe in 1839". SDUK Penny Cyclopedia. Old Towns Books & Maps.